Crops in bloom can create opportunities for farmers and property owners. Farmers are finding that crops in full bloom can attract more than bees and butterflies. Colorful fields of sunflowers, canola, lavender, and clover are among those proving to also be unexpected tourist attractions. For a few weeks a year they can be an opportunity to not only pocket a little income but also polish agriculture’s image. Last fall, the glow from a 40-acre field of sunflowers near Kansas City drew tens of thousands of visitors to the Tonganoxie, Kansas, farm of Ted and Kris Grinter. The rush on Labor Day weekend was so large traffic caused a safety concern and local officials asked for a temporary shutdown. While the Grinters have started charging $1 per bloom if people harvest the blooms, they don’t do it for the money. “We’d really prefer people didn’t pick them—they don’t make good cut flowers and the field isn’t as beautiful, but people want a keepsake and as farmers we have to make money whenever possible,” says Kris. 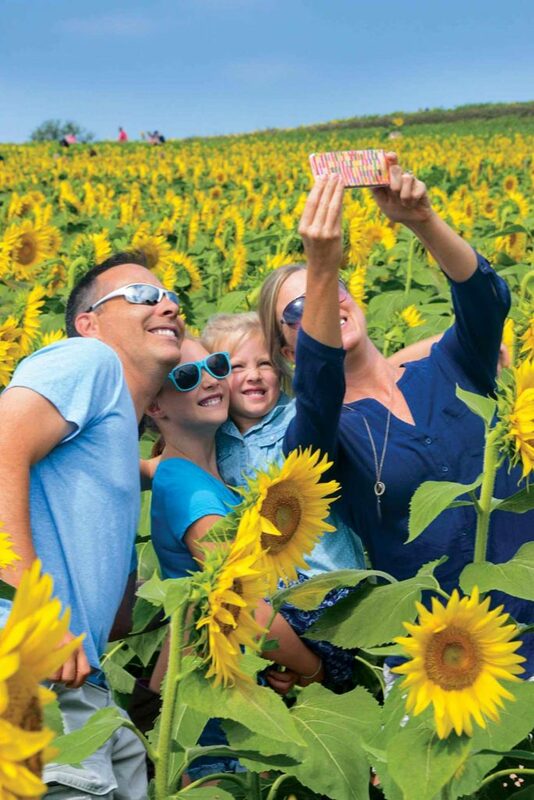 A field in full bloom is a great place to take a sunflower selfie of the family. The Grinters have been growing sunflowers for 40 years, but the power of social media has turned their primary goal of producing birdseed into an agritourism success story. “We’d always noticed a few flowers missing on the outside rows of the field, but four years ago our daughter suggested we put up a Facebook page for the farm (facebook.com/GrinterFarms) and things exploded,” says Ted. A little education. Kris uses the Facebook page to update viewers on the progress of the crop and to impart a little insight into the challenges farmers face. “The page saves endless phone calls, and it also allows people to share their experience. Every year farmers tell us we’re crazy to open our field to the public, but then someone shares a story that makes you feel really good—or breaks your heart—and we remember why we do,” says Kris. Sunflower selfies are the goal of most visitors to the field, though professional photographers also use it as a backdrop (with a requested donation). “We also get an occasional request for a wedding, but we discourage that because we learned pollen will stain a wedding dress,” says Ted. Ted uses a seeding rate of 22,000 per acre and gets about 90% emergence. “If you figure people cut an average of one flower apiece—and knock down one more—then we’re giving up three to four acres of the crop. When we harvest it we still get a yield around 1,000 pounds per acre,” he says. When Carroll, Ohio, soil health advocate Dave Brandt began growing cover crops in his corn/soybean rotation, his suburban neighbors quickly noticed the change. “We were planting solid stands of crimson clover and the bright red fields really sparked interest, so we we’re able to sell blooms by the bundle,” says Brandt. Flower power. Bright yellow canola also catches the eye—even of international travelers. Last year, Japanese tour companies began offering day trips on their tours of English castles to also take in rolling fields of canola. The lure of a field of lavender launched a business for East Marion, New York, farmer Serge Rosenbaum. “We started with a small patch of lavender that we used to enable production of lavender honey, dried lavender, and lavender sachets. One year, we had more than we needed so while on vacation we put up a sign inviting people to help themselves. The bucket we had left for donations was overflowing, so we decided to expand our family business,” says Rosenbaum. “The lavender typically blooms three times a season and we’re swamped with visitors,” says Rosenbaum. Plant a few wild ones and see what happens!